I have to tell you a quick story. 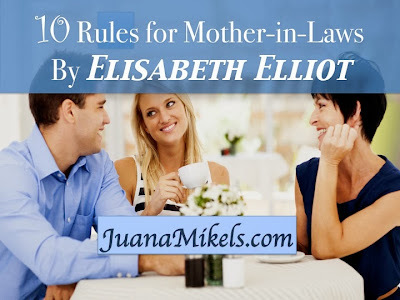 I hand-wrote 10 Rules for Mother-in-Laws from Elisabeth Elliot before the days of laptops over 15 years ago. I shared it with an older woman who shall remain nameless who was a mother-in-law already and desperately wanted it right from my hand. I gave her my original, asked her to please make a copy, and return it to me. Fast forward over 10 years later. Last year, I got a letter in the mail. It was my original sheet! She said she took a book off the shelf and it fell out of the book! It was like an old friend had suddenly showed up! 1. Thank God for this person. It is a privilege to be a MIL. Thank God for this acquired daughter or son. Elisabeth has the privilege of being MIL to Walt Shepard. Walt is a gift from God. Elisabeth prayed for a godly husband for her daughter. Pray for the spouse even if you have little ones. Pray that person will be prepared for your son or daughter in God’s way and in God’s time. 2. Remember this man or woman is an adult with adult responsibility. The fact that he or she is your daughter or son’s peer sometime makes us forget he or she is not a child. Unconsciously, we treat this person as a child, because we treat our child as a child. This man or this woman given to your son or daughter is an adult with adult responsibility. He or she is capable of making her/his own decisions. Allow that person to do that. 3. Remember that your daughter or son now belongs to your son or daughter-in-law. Walt has a special claim on Valerie (Elisabeth’s daughter) such as Elisabeth has never had. Val was lent to Elisabeth as a gift and in the wedding she gave her to Walt. 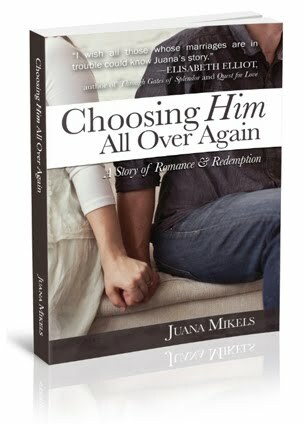 She relinquished her in her heart to this man (Elisabeth’s brother Tom gave her away). She now belongs to someone else, not to you. Scripture says a man is to leave his father and mother and cleave to his wife. Leaving and cleaving are not always easily accomplished. MILs can stand as a very big obstacle to his leaving you and cleaving to his wife if you continue to claim him. You son-in-law or daughter-in-law has a special claim on that person. 4. When you give something, you’ve got to let go of it. Let go of your daughter and your son-in-law and your daughter/son. 5. Expect your son-in-law to be different. He comes from a different family. They have different ways of doing things. He’ll be very different. Don’t be surprised! Expect it! We get so shocked to find out simple things can be done in a different way. Your son-in-law may be used to clean towels everyday, etc. 6. Let your daughter/son do things their way. When you visit them in their home and you see things are not the way you did them in your home… Let them be. 7. Do not dish out advice. Keep your mouth shut. (Juana: I happen to know after Val had her 4th child in rapid succession, Elisabeth thought Val was overtired and too busy. Elisabeth bit her tongue on asking Walt to sleep in the back yard!) It’s different if your son or daughter-in-law ask for advice. She has a wonderful son-in-law who will ask for her for advice on this and that, and her daughter continually asks for advice. But Elisabeth is sure she’s given free advice when not asked for and they’re both very kind and have never made her feel she’s intruded in their lives. It is so easy to do this! Why do you do this? Why do you do it that way? Be careful. 8. Pray for your son or daughter-in-law. There will be things you will be critical about. There’s an old song: You can talk about me just as much as you please. I’ll talk about you down on my knees. Undoubtedly your son-in-law or daughter will talk about their mother-in-law and father-in-law. Rather than criticize her to other people, do your praying first. Be sure to pray for that in-law. 9. Never criticize your daughter-in-law or son-in-law to your son/daughter. He knows her weaknesses better than you do, and strengths you’ve never noticed. Keep your mouth shut when it comes to criticizing your son-in-law or daughter-in-law to your daughter or son. 10. Be an encourager in every way you can think of. Ask God to show you ways to encourage them that you haven’t though of. 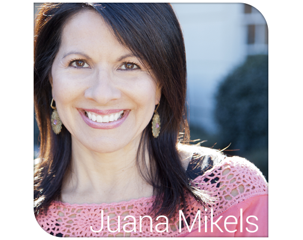 Example: She copies out bits of spiritual wisdom (her SIL is a pastor) on 3 x 5 cards with title and subject at the top so he can retrieve them to encourage him (Juana: he doesn't file them, but I'm sure Elisabeth keeps her mouth shut on that even though "her way" would be to file them). She asked him if they are useful or if she is bothering him by sending him the cards. He says they are useful and by all means, send them. She tries to encourage him in his father role. He is a wonderful father to her grandchildren (8!) and she tries to tell him so. Be an encourager to your daughter in every way you can think of. Is she doing a good job as a wife? Tell her so NOW. Your son doing a good job as a husband? Tell him so. But do it in such a way as they don’t feel you are scrutinizing them. I was blessed to know and be mentored by Elisabeth Elliot. I bought a plastic file container to hold all the gold nuggets that I learned from her since 1992! I saved a beautiful ribboned box for my over thirty treasured personal letters from her. One of my reasons for writing is to pass on her words of wisdom regularly to the social media generation, and when I write and speak. 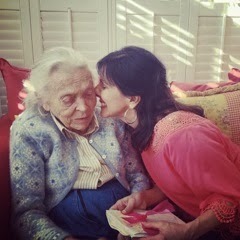 Showing Elisabeth the 35 treasured letters she's written me since 1992 filled with wisdom. when they came for a visit in March, 2013. With All Saints Day tomorrow, I'd like to thank God for the life of Elisabeth Elliot—who taught countless women of whom I'm but one that God loves us "with an everlasting love!" For my other posts on Elisabeth, click here, or you may also want to read my bio. As always, I'd love to connect with you wherever you most like on: Facebook, Twitter, Instagram, Pinterest (I have a special new board there on Elisabeth), Youtube or Google+. You may follow my blog here (Click "Elisabeth Elliot" at top of my blog for posts on her) or on Bloglovin'. Very interesting list of rules. I think every parent- not just mothers-in-law - need to think about this list, especially #2. The transition from a parent-child relationship to a parent-adult relationship is tricky, and if not handled properly by the parent, the relationship will be shattered. Speaking from personal experience with my parents. Yes, Nicole! There is a lot of application for just releasing of older children, isn't there? So glad you pointed that out. So sorry for your shattered experience during those years in your life. 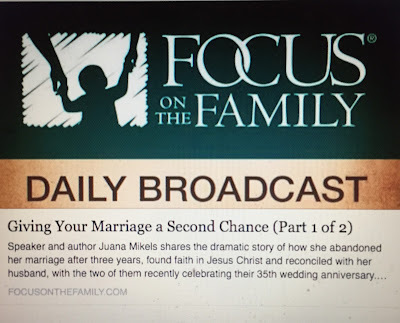 It is a strong challenge to us as parents and or future mother-in-laws, and those who currently are both. Stay strong in grace, Sister! Wonderful advice! I am a brand new mother-in-law. Our oldest son married his lovely wife one month ago. I have a sweet mom who found it very difficult to stop parenting me, and continued to try to give advice about my clothing and hair (etc.) even though I am a grown up and married with children of my own, lol! I had to patiently and prayerfully work with her and try to remind her that her job of raising me was done in that respect. She just felt like it was still her responsibility to talk with me about things she didn't like (such as don't wear socks, wear nylons instead); perm your hair, etc.) and personal preferences and parenting ideas, and she saw it as part of her job as a parent. My age did not matter to her as I was still her child and so she still saw it as her role. And I am so proud of her and how she has learned to let me wear my hair the way that I want and the clothes that I want without commenting for the most part, and raise our children how we have felt led by the Lord to do. She still has her moments but has come a long way. I love how your story shows that you can mentor over long distance. We don't have to be stopped by a face to face experience and are free to encourage and build up in the Lord whomever the Lord brings across our paths! I just love that you took the time to show us how you have lived the other side of this. The Lord knows exactly who He has for our mothers, and all our past for that matter and He wants to use everything to conform us to His image. My mother is in her 80s, & when she sees me she says, "Everytime I look at you, I want to cry! Your hair! It used to be so thick! Stop washing your hair so much!" Aaahhh, Mama! She doesn't know her job of raising a little girl is over. But that can teach us so much... patience, forebearance, graciousness... Of course, I blow it sometimes with my mother, and have to apologize to which she says, "Don't apologize to me, I'm your mother!" All the more reason, I need to say that I'm sorry, and not take my little 85 year old mother for granted. I'm blessed to still have my mom. She was born one year and one day before Elisabeth Elliot. Isn't that something? I love what you said about ministering over Internet. I always wanted to teach & had no idea it would be through typing! God bless you, Nan! So glad we've now "met"! You can wear your jeans and sweatshirt any ole time at my house, too! May we be good daughters by God's grace to a world that needs the love of Jesus! Thank you so much for this. First of all, I absolutely adore Elisabeth Elliot (and that is based only on reading her writings... what an amazing blessing to have actually KNOWN her!) Secondly, my oldest has been married since last December. I love my son in law, I bite my tongue a LOT as the kids struggle and learn together and have been known to back away even from asked-for advice because I want them to find their own way. My own mother is very, VERY overbearing and I have never wanted to be that. I must be doing something right... I get giant bear hugs every time we meet or leave each other (and as my son in law is a very big guy, his bear hugs really are giant!) and we spend at least one afternoon a week or more together... he loves playing with his little brother and sisters in law... These "rules" will help guide me even more!! Hi; I was drawn to this site, looking for ways to pray for my daughter in law. She is a beautiful woman, that does not know Christ. 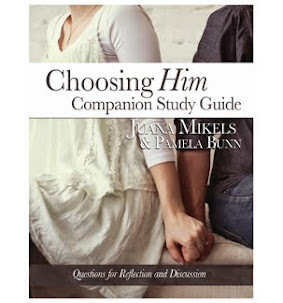 We have gone through "hell" with my x-daughter in law and her boyfriend. They have been alienating our four grandchildren from us for 4 years now. One child is emotionally gone from us. The other three are teeter-totting. I am learning to trust God and stick very close to his word. This has been a heartbreaking thing for us to go through. I love my son and grandchildren more than life itself, but, not more than my God, through Jesus. Any encouragement out there. Can I also add - don't keep telling your daughter/son-in-law how lucky they are to be married to your son or daughter. It makes them feel worthless and like they are not measuring up. It feels the same as saying "You aren't good enough for my son/daughter." Thank you for sharing this gem. I heard this episode on BBN a few weeks ago and planned to relisten to I could write the key points down. Unfortunately it was take off the air before I had the chance. So happy my little google search brought me to your page so I could have a copy of her "rules". Blessings to you!